How Panasonic's Visual Systems are entertaining three generations of visitors at Denmark's newly opened cultural historical museum in Aarhus. When redesigning the Moesgaard Museum the team set out with a vision, to "have a museum where we are able to create an exhibition which we feel will give three generations a shared museum experience." The 15,000-square-foot exhibition building opened to the public on 11th October 2014. Designed by Henning Larsen Architects, it contains archaeological and ethnographic exhibits, a special exhibition room, a student exhibition space, auditorium, meeting and conference rooms, cafe, museum shop and a grassy roof, where visitors can view the sea, the forest and the beautiful landscape surrounding Moesgaard Manor - the former home of the Moesgaard Museum. Built at a cost of 393 million Danish kroner, the museum brings together the latest in audio visual techniques that inform older visitors and engage younger ones too. In the first month alone, the museum attracted over 50,000 people, more than the previous museum attracted in a full year. Panasonic has a wide range of DLP projectors that fit the museum and exhibition market very well, both in terms of brightness and interchangeable lenses. The range of lenses used at Moesgaard Museum make it possible to produce installations in demanding environments where the building architecture, content and visitor experience are all critical factors. The DLE-030 ultra-short throw lens was a key component in making some installations a reality. Furthermore, the high contrast of the PT-RZ470 LED laser light source projector meant it was possible to successfully project animations on to surfaces that would traditionally be off limits. In this case, animations are designed to 'break through' the largest theatrical canvas in Denmark, which was painted to create an atmospheric backdrop for an Iron Age exhibition, featuring the world's best preserved bog bodies. able to recreate two opposing animated 'Viking Armies' on opposite curved walls. "The new building fulfills the vision that we have been working towards for many years; to have a museum where we are able to create those exact exhibitions which we feel will give three generations a shared museum experience." The DLE030 lens was a key factor in bringing some installations to life. By mounting the ultra-short-throw lenses onto Panasonic's high brightness DLP™ projectors, you can shorten the projection distance by approximately 60 % compared to regular short throw lenses. A full range of Panasonic displays are used across the museum for way-finding, video content and digital signage. The museum has also used a touch screen overlay in order to increase interactivity on a number of exhibits - often combining the touch screen with dynamic HD video content. Moesgaard Museum has the archaeological responsibility for the local area around Aarhus and also carries the status of a specialised museum. This means that the archaeologists at the museum also carry out archaeological research at home and abroad. It was this passion for history that led the team to choose a different approach to the design and installation of exhibits. Instead of hiring an external company to oversee the AV installation, this was managed by the internal team. Panasonic's engineering team was called upon to offer advice on the feasibility of what had been specified. The result is a museum which reflects the passion of those who work there every day, and a number of requests from other museums and institutions for advice on their redesigns. At Moesgaard Museum, the traditional exhibition concept is challenged by going beyond the objects normally exhibited in large numbers at historical museums, and presenting an animated picture of the people who handled these objects day in and day out. 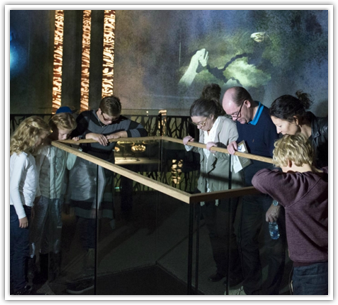 Using 'scenographic environments' and a audio account in your ear, visitors are invited to follow in the footsteps of Vikings along the narrow smoke-filled alleys of Aros, Viking Age Aarhus. Johan Ahrenfeldt, Exhibition Technology Manager said, "We wanted to integrate the AV design in to the overall creative process, and to design ambitious exhibitions. This is when you appreciate and rely on the type of partnership we have with Panasonic, to make sure that the final result is worthy of the level of investment." "The DLE-030 lens was a key factor in making some of the installations come true, enabling us to stick to our ambitions regarding architecture and visitor experience. It allowed us to be flexible and to break new ground in terms of this type of museum."